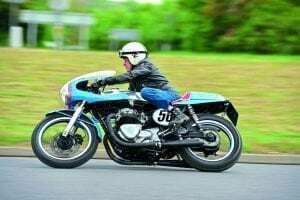 When Kawasaki launched the W650, its take on the infant retro market that actually preceded Triumph’s relaunched Bonneville (1999 for the Kwak, 2001 for the Bonnie, according to Wikipedia), a lot of people didn’t realise quite how ‘retro’ it was. You see, the ‘W’ in ‘W650’ refers to Kawasaki’s W1, W2 and W3 models, manufactured between 1967 and 1975. 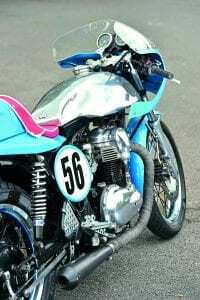 The original W-series bikes were a development of the Meguro K, a bike built by the Akashi-based Meguro Manufacturing Co using a licence they had from BSA in the UK and was, basically, a copy of the venerable BSA A7 500. In 1963 Meguro was taken over by the newly formed Kawasaki Motorcycle Corporation, which maintained the licensing agreement with BSA and continued to build the K model. 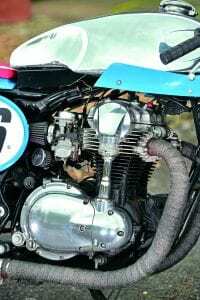 The BSA design, though, suffered from lubrication problems (as BSA owners know all too well), so they made a few engine modifications, and the Kawasaki K2 entered production in 1965 with improved crankshaft bearings and a larger oil pump. 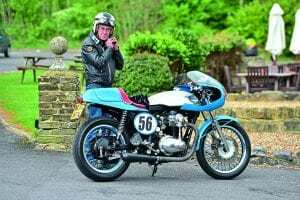 It also had a larger timing cover which distinguishes it from the original K (and the BSA A7), and a different rear subframe, fuel tank and side panels. In 1965 the K2 was enlarged to 624cc to become the Meguro X-650 prototype, which was displayed at the 1965 Tokyo Motor Show, and became, in turn, the prototype for the Kawasaki W1. For the new bike, the traditional look of Meguro bikes was replaced with a sleeker fuel tank, sportier mudguards and other details intended to appeal to export markets, especially North America, and is actually reckoned, by The Society of Automotive Engineers of Japan, to be one of their 240 Landmarks of Japanese Automotive Technology. Given its parentage then, the W650 (and its W800 bigger brother) is a pretty good base to use to build a retro custom bike, and so that’s what Tony and Jeanette from The Motorcycle Workshop did to create the bike you see here before you. Established in 2000, The Motorcycle Workshop in Sussex is a family-run business, with husband and wife team Tony and Jeanette having a passion for motorcycling of all sorts. Tony is an ‘old school’ mechanic – the kind who make things or make things fit, not just fit new parts – and he goes to great lengths to make the bikes he works on stop and go as best they can. The W650, you see, is quite a handy tool in stock form; it’s smaller and lighter than the relaunched Triumph Bonneville of the era, and actually looked and felt more like a Bonnie, an original Bonnie, than the genuine, albeit new, Bonnie did (I know, I rode both of them back to back). It went well and handled okay, and so, as there wasn’t much wrong with it in the first place, Tony decided to leave as much of the chassis alone as possible and concentrate on getting the look right. He started by ripping all of the bike’s bodywork off (the beast! Copyright Barbara Cartland 1901-2000), and then, as it stood cowering and shaking in the workshop, trying desperately to cover its modesty, he made up his mind what he was going to do with it. The tank was replaced with a Manx-style alloy one that gives that perfect cafe look and the seat with a one-off Ducati-style race unit, and he’s added a fantastic-looking Rickman-style race fairing that really gives the Kwakka the correct period look and, along with the fact that there’re no Kawasaki logos on the motor (and the fake pushrod tube), helps to utterly perplex casual onlookers who can’t work out why a 1960s bike has a 2002 reg’ plate. Neat little touches abound; the modified top yoke (with the handlebar mounts removed) and period-correct dummy steering damper, the very Chronometric stock clocks (which’ve been tilted upwards slightly to make them readable in the new fairing), the drilled and lightened Raask rear-sets with one-off heel-plates, the Hagon shocks, the black-painted drum brake (rather than a disc which wouldn’t’ve looked quite so authentic), the suitably ’60s tail-light, the short wrapped exhausts with their reverse-cone megas – everything about it just screams ‘proper cafe racer’. 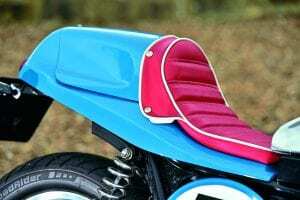 They do admit that there were a few teething problems with the bike – the original fairing brackets, for instance, broke due to the weight of the headlight in the front cowl – but now that they’ve been remade in a heavier steel, the W650 rides and handles perfectly, and feels like a 1960s British bike… except that it doesn’t leak oil, starts on the button and stops when the brakes are applied, of course. Future plans for it are to strip it again, and chrome-powdercoat the frame, and repaint the fairing, seat and front mudguard (maybe in red, they haven’t decided yet), but it’s up for sale so it can be bought as it is or they can modify it to suit any potential purchaser. What colour would you like it?